How do I reset my password when I have forgotten it? A user can reset his/her own password at any time. 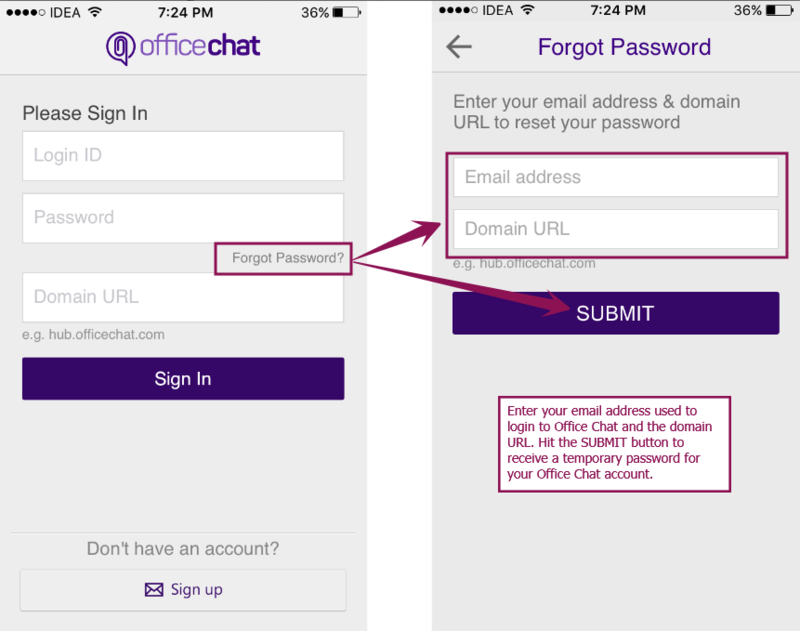 As a security measure, the user will receive the temporary password on the office chat registered email address. 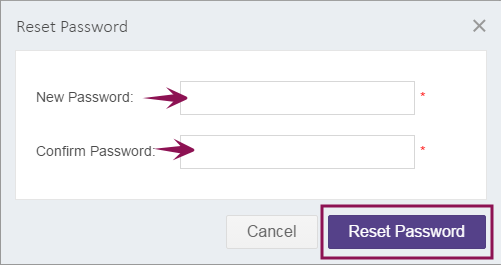 Enter your valid email address which you use to login to Office Chat and click “Reset Password” button. 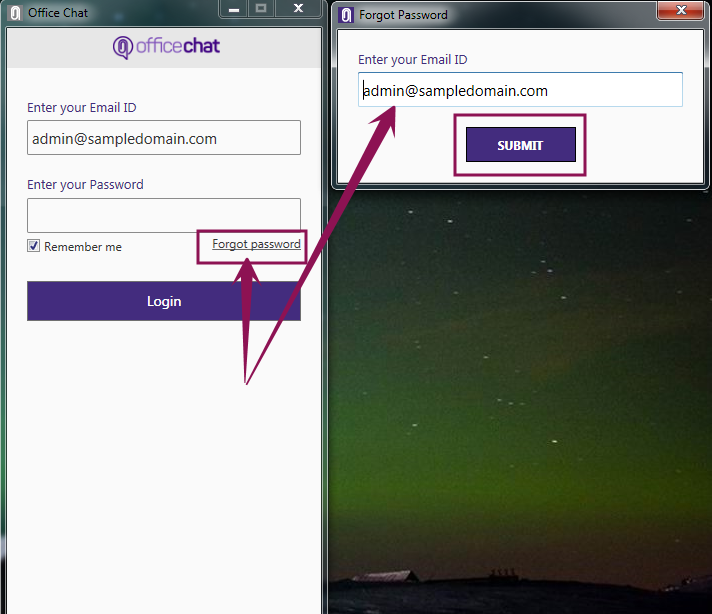 Then you’ll receive an email with a “temporary password” which you can use to login to Office Chat. After a successful login with the temporary password, as an additional security measure you will be required to set a “new password”. This new password you enter will be the password you use for subsequent Office Chat logins. Launch the app and on the login screen click on the “Forgot Password” link at the bottom. In the forgot password dialog box, enter the email address with which you hold an Office Chat account and click on SUBMIT button. Then you’ll receive an email with a “temporary password” that you can use to login to Office Chat. After a successful login with the temporary password, as an additional security measure you will be required to set a “new password”. The new password you enter will be the password you use for subsequent Office Chat logins. In the forgot password dialog box, enter the email address with which you hold an Office Chat account and click on “Get Password” button. Then you’ll receive an email with a “temporary password” that you can use to login to Office Chat. After a successful login with the temporary password, as an additional security measure you will be prompted to set a “new password”. The new password you enter will be the password you use for subsequent Office Chat logins. 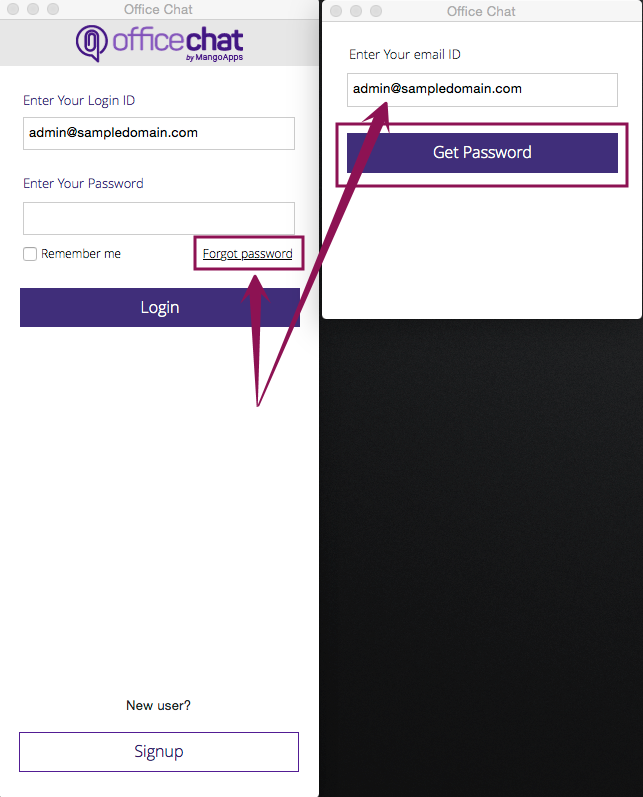 Launch the app and on the login screen click on the “Forgot Password?” link at the bottom. 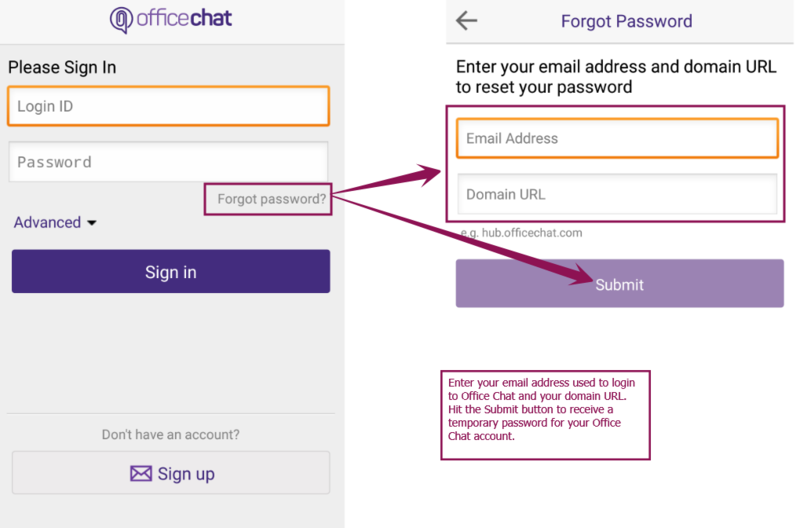 In the forgot password dialog box, enter the email address and domain URL with which you hold your Office Chat account and click on “SUBMIT” button. Then you’ll receive an email with a “temporary password” that you can use to login to Office Chat. You can ask your domain admin to reset the password temporarily for you. Ask your domain admin to login to Admin Portal. Navigate to User tab and select the checkbox next to your name. Then, expand the “User Tools” dropdown menu and select “Reset Password” option. Clicking on Reset password will open a dialog box. Domain admin will enter a temporary password and will share this with you. 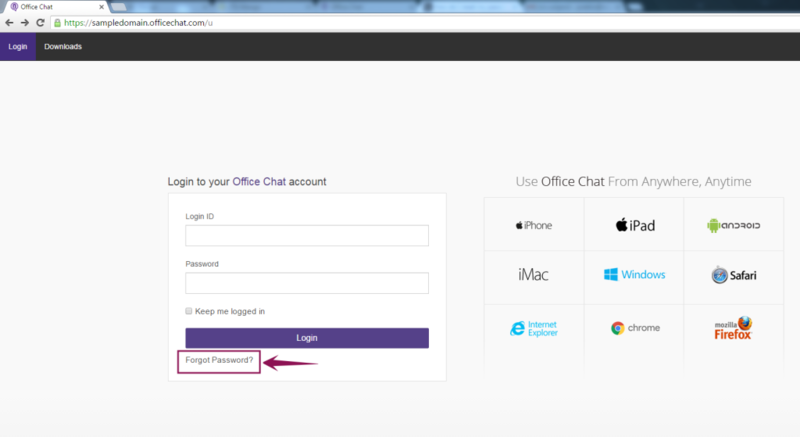 Once the domain admin shares the temporary password, you can then use it to login into Office Chat. For security purposes, after you login, you will be immediately asked to set a new password. The new password you enter will be the password you use for subsequent Office Chat logins. The email received after performing “Forgot Password” action will have the subject as “New password for Office Chat “. Please search the email by this subject. In case the email is found in Spam folder, please mark it as “Not spam”. What browsers does Office Chat Support? 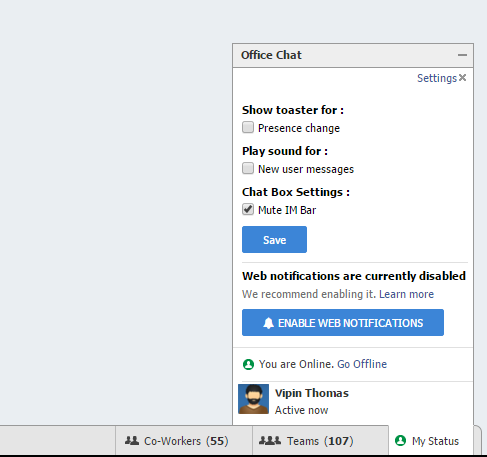 Office Chat is designed to work with the current or the immediately preceding versions of Internet Explorer, Mozilla Firefox, and with the latest version of Google Chrome and Safari. However, for the best experience when you use Office Chat, we recommend that you always use the latest version of the browser in question. Firefox and Chrome are both designed to stream updates to your devices every six weeks. Many common problems with these browsers are resolved in each update and we take every effort to test and support the latest version. Note: Beta versions of web browsers are not supported, but they are quickly added to the supported list after they’re formally released. If you’re using Chrome, Safari or Firefox, your browser can generate web notification, web Notifications informs you about chat messages that need your attention, even when you’re looking at a different application or are away from your computer altogether. Office Chat will display a small popup window on your desktop when you are in a different application. The popup will contain the first portion of the message you received and can optionally play a sound. See Configuring web notifications for more details. To enable web notifications, click “My Status” on the Social bar then “Setting”. If you see a green Enable web notifications button, you’ll need to click that button and tell your browser to allow Office Chat notifications. If you are having issues getting notifications setup it’s possible that permissions have been denied for allowing us to show them. To check and see if that’s the case, use the guide below based on the browser you are using. Copy this link chrome://settings/contentExceptions#notifications and open it in a new tab. Find yourdomainname.officechat.com and remove it from the list by clicking the “X” on the right hand side. In the tab with yourdomainname.officechat.com loaded, right click on the page and click “View Page Info”. In the panel that opens, click the tab “Permissions”. Scroll down to “Show Notifications” and check “Use default” and close the panel. Select yourdomainname.officechat.com and click the “Remove” button. And that is it! Once you do that, go back to your Office Chat domain and refresh. You should be all set to get notifications for chat messages! 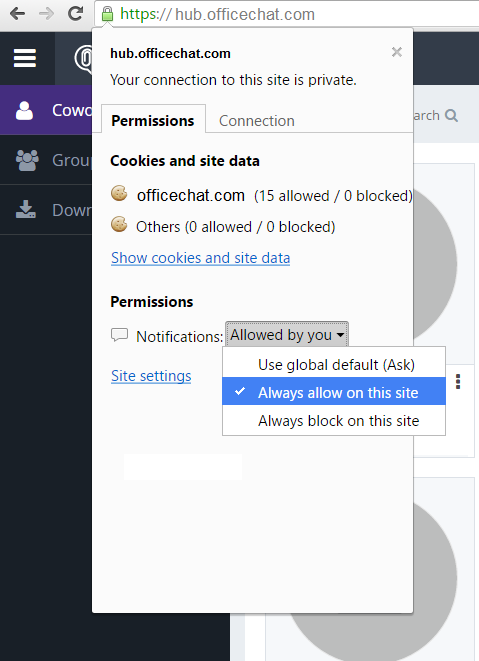 Web notifications are supported in the standalone Office Chat desktop application and in recent versions of Chrome, Firefox, and Safari. If you aren’t sure whether your browser is supported, visit http://caniuse.com/#feat=notifications. What can I use the Office Chat Web app for? The Office Chat Web App is for Office Chat Premium users. Advanced features for domain control, user management and security are but a few of the features available in the Office Chat Web App. Review the Office Chat Premium Features article for a complete overview of what is offered in the Web App.